Habit: Perennial herb, shrub, generally +- green, parasitic on aboveground parts of woody plants; dioecious [monoecious]. Stem: brittle; 2° branches generally many. Leaf: simple, entire, opposite, 4-ranked, with blade or scale-like (then each pair generally fused). Inflorescence: spikes or cymes, axillary or terminal; bracts opposite, 4-ranked, scale-like, each pair fused. Flower: unisexual, radial, 2--4 mm; perianth parts in 1 series. Staminate Flower: perianth parts 3--4(7); anthers generally sessile, opposite and generally on perianth parts. Pistillate Flower: perianth parts generally 2--4; ovary inferior, 1-chambered, style unbranched, stigma +- obscure. Fruit: berry, shiny. Seed: 1(2), without thickened coat, gelatinous. Genera In Family: 7 genera, +- 450 species: tropics, generally northern temperate. Toxicity: All parts of most members may be TOXIC. Note: Sometimes included in Loranthaceae; parasitic on plants in many other families. Habit: Perennial, woody at least at base, glabrous or short-hairy. Stem: generally > 20 cm, not angled, green, less often +- red. Leaf: with blade or < 1 mm, scale-like. Inflorescence: spikes, few- to many-flowered, peduncled; flowers +- sunken into axis. Flower: perianth parts generally 3. Staminate Flower: anthers 2-chambered. Pistillate Flower: perianth parts persistent. 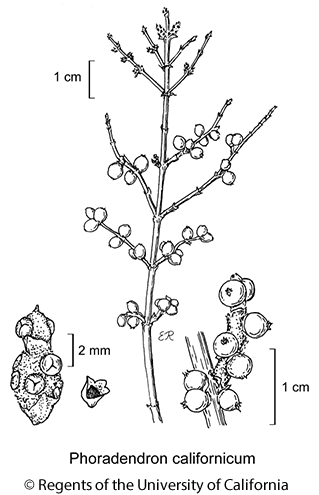 Fruit: +- 3--6 mm, +- spheric, 1-colored, white, pink, or +- red, bird-dispersed; pedicel 0. Chromosomes: n=14. Unabridged Note: Phoradendron leucarpum (Raf.) Reveal & M.C. Johnst. (Phoradendron serotinum (DC.) A. Gray; name change relative to TJM2 made necessary by ruling of Committee for Spermatophyta) collected in Texas for sale nationally in Christmas trade; other species similarly important locally. Plants at some sites (e.g., Pinnacles National Monument) do not conform to key(s) and/or descriptions, as to hosts and/or morphology (see Kuijt 2003); such problems thus far unsolved, though minimized here. Stem: 4--10 dm, erect to spreading, +- red to green, canescent, especially at tip, +- glabrous in age; internodes 13--28 mm. Leaf: < 1 mm, scale-like. Staminate Inflorescence: fertile internodes 1--3(6), 6--14-flowered. Pistillate Inflorescence: fertile internodes 1--3(7), 2(3)-flowered. Fruit: +- 3 mm, white to red-pink, glabrous. Synonyms: Phoradendron californicum var. distans Trel. ; Phoradendron californicum var. leucocarpum (Trel.) Jeps. Citation for this treatment: Job Kuijt 2013, Phoradendron californicum, in Jepson Flora Project (eds.) Jepson eFlora, Revision 1, http://ucjeps.berkeley.edu/eflora/eflora_display.php?tid=37896, accessed on April 20, 2019. WTR, D; Markers link to CCH specimen records. Yellow markers indicate records that may provide evidence for eFlora range revision or may have georeferencing or identification issues. Purple markers indicate specimens collected from a garden, greenhouse, or other non-wild location.